Due to an economic crisis and a declining housing market, Tempe residents have felt the impact of rising debt. Arizona, in fact, was one of the most affected states in the nation by this crisis, and has seen an increase in bankruptcy filings since 2009. Faced with elevated debt, homes worth less than their original purchase price, and unemployment, many Tempe, Arizona residents found themselves filing bankruptcy as a means to take back control of their finances. Bankruptcy is a way for folks in Tempe to reorganize, eliminate, or reduce debt. 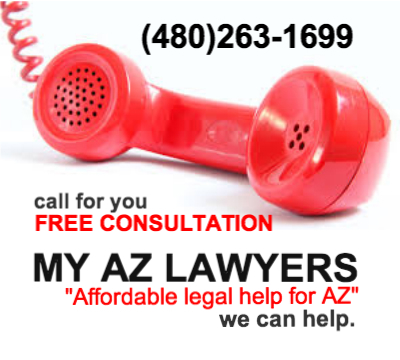 If you live in Tempe and are faced with a bankruptcy or other financial crisis, call My AZ Lawyers. The attorneys at My AZ Lawyers have the expertise in practicing Arizona Bankruptcy Law. My AZ Lawyers will help you get your finances into a manageable state —- whether you are seeking Chapter 7 or 13 bankruptcy protection, or you need some options for debt relief. Begin your road to financial success by contacting My AZ Lawyers and scheduling a FREE CONSULTATION. You will be able to discuss your financial matters with an experienced attorney either by phone or in office. My AZ Lawyers has experience dealing with a all kinds of different financial scenarios: it is important to recognize all the debt, evaluate it, and then get options for the best way to eliminate the debt. The attorneys at My AZ Lawyers have experience representing clients in Tempe, Arizona, and they are willing to hear about your situation and then offer advice and suggest options. Tempe clients are satisfied with the services and representation offered by My AZ Lawyers, because the staff is friendly, competent, affordable, and they assist clients all the way through the bankruptcy process —- from the first initial consultation through successful post-bankruptcy practices. Turn your life around from debt, stress, frustration, and anxiety— to hope, achievement, a brighter future, and financial freedom! Make a connection with My AZ Lawyers for assistance in Tempe for debt-relief services. Tempe was named after the Vale of Tempe in Greece. It is located in the East Valley section of the Phoenix Metro; a popular suburb of Phoenix. Tempe used to be called Hayden’s Ferry during old territory times: a Statue of the founder of Tempe may be seen at the Charles Trumbull Hayden Memorial. On the north part of downtown Tempe is the Haden Ferry Lakeside development. Arizona State University (ASU Sun Devils) is located in Tempe. With an undergraduate student body of almost 34,000, ASU is Arizona’s largest institution of higher learning. The Sun Devils play at Sun Devil stadium. Also in Tempe is the Arizona State University Art Museum, which houses rotating art exhibits. ASU’s Gammage Auditorium is a great performance venue in Tempe, and there is an arboretum at ASU which contains more than 300 species of plants fro various regions of the Arizona desert. Since 1971, Tempe has had a sister city: Skopje, Macedonia, and since 2012, Cusco Peru. (Tempe has been voted “Best Overall Sister City Program” city). In addition, Tempe hosts the Los Angeles Angels of Anaheim baseball team at Tempe Diablo Stadium, and has one of Arizona’s largest shopping malls, Arizona Mills. 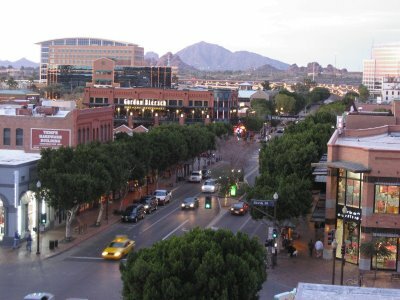 Tempe Marketplace is a large open air mall located near Tempe Town Lake. Originally built in 1931, Tempe Beach Park has been renovated and connects to 5 miles of bike paths circling Town Lake. Splash Playground is a 1 acre playground at Tempe Beach Park.